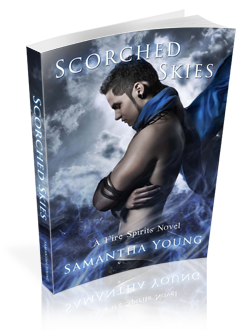 Today, we are showcasing the second book in Samantha Young’s Fire Spirits series, Scorched Skies, and more specifically, her completely swoon-worthy leading man, Jai Bitar, who just happened to stop by for a little chat. 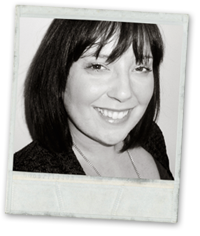 Samantha Young is a 26 year old writer who resides in her home county of Stirlingshire, Scotland. She is a self-proclaimed book addict and Kindle junkie, using fantasy, dystopian, sci-fi and paranormal novels to feed her addiction. Samantha’s first release, The Tale of Lunarmorte trilogy, was followed by a second series titled Warriors of Ankh. At present, she is a full-time writer working on a number of projects for near future release. She is the author of nine novels and one novella. 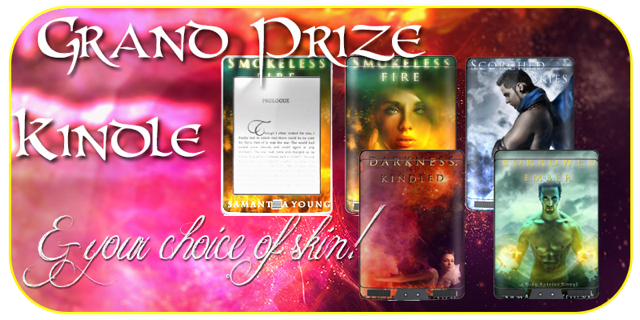 Her young adult paranormal series are Amazon bestselling novels. Everyone who enters gets a shot at winning the grand prize! Tuesday, October 30th – Tsk, Tsk! What To Read? Wednesday, October 31st – I Just Wanna Sit Here And Read! What a hottie! lol Seems charming and sweet as well. I should meet him and Ari. Thanks for sharing! Yeah. He’s pretty drool-worthy… you need to meet him 😉 Thanks so much for dropping by! I am not good to make questions ( your questions are really good ) but I would really love to meet him too. lol… thank you Artemis! Yes, coming up with interview questions is always kind of difficult. 😛 Thank you so much for stopping in for the tour! Best of luck in the giveaway! I haven’t met Jai, but really want to Sounds great! Love the interview! Thanks for the awesome giveaway! I don’t know what to ask him, I am too dumbfounded by his looks and my mouth is still hanging open! would you rather have a tail like a monkey(proportion ate strength ect.) or be able to shed your skin like a snake?? How have you managed to stay under my radar this long? First question: Is that you on the cover?? Second Question: What made you fall in love with Ari? You were hesitant in the beginning, what made you break through the barriers? Is it hard to do what you do and not be able to be a teen or have a relaxed life? I love the last line of the description – that alone makes me want to pick it up. Sorry, I didn’t add a question – that’s what I get for having a slow internet connection, the rafflecopter had not loaded yet. what a great post! This book sounds fabulous! Thanks for the chance to win it. Congrats to Samantha on the release! So my question: what do you have to have/do while writing? What ur favorite movie?? and why? This book sounds fantastic! Can’t wait to read it! Not sure what I would ask! Great giveaway! What’s your favorite sci-fi book? Where is your fave place to escape to? I don’t know what I would ask. Maybe what he hopes the future holds. I haven’t met Jai, but really want to 😉 Sounds great! Is it count if I would ask him to marry me?? LOL He seems so sweet *swoon* Loved the interview! Aww! I love Jai!! Hmmm… If I were to ask him anything I would ask…. When is he going to propose to Ari? I mean even though they just got together, they obviously belong together. Thanks for the giveaway!! How do you picture your life in 10 years and what would you like to be doing? Thanks for this amazing giveaway – I would love to win! I don’t know what I would ask, because I am not good to make questions so I just wanna know, when Jai will propose Ari? I’d ask Jai how he manages to put up with his family without going postal. Id ask him to marry me 😉 What a hottie!! !